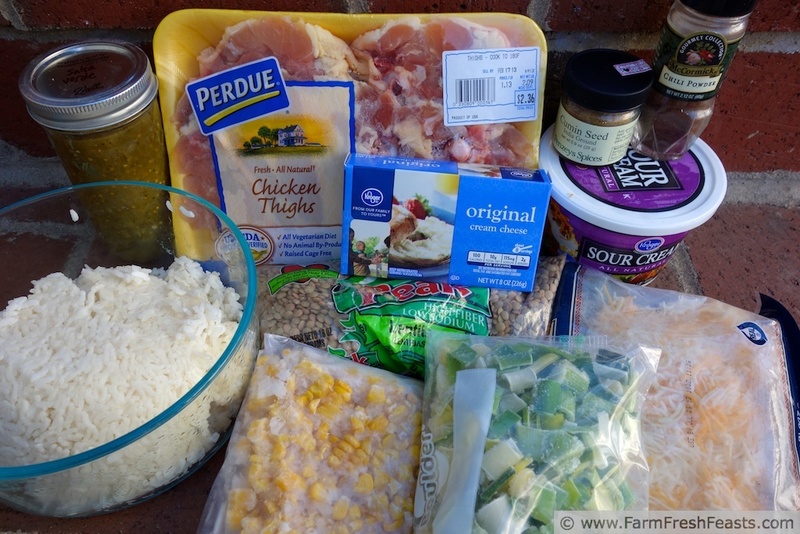 Most home cooks, and even the professionals down the road at Dorothy Lane Market, know the value of turning to a Kitchen Sink type recipe when faced with a fridge full of dinner building blocks. I'm pretty sure a lot of classic Hot Dish combinations came about because a cook looked to his or her fridge/freezer/pantry for a substitution instead of trekking to the store. Even though my local store is only a 1 mile (Map My) walk away, complete with a water dish for the waiting Simon, I'd rather use what I've got on hand. Sometimes, the result is good enough to be written up and appear here. I was mulling over what to call this dish while working a Hunger Study 2014 survey site. My fellow volunteer, Bob, kept offering title ideas that were more general. I kept coming up with very specific titles. This was our compromise--it's got the Mexican Chicken Bake part from Bob and the Chicken Lentil Rice part from me. You know, in case I do a Mexican Chicken Bake using garbanzo beans, Maui onions, zucchini, butternut squash, and orzo next. Or something. Who knows? Because I only used 2 large chicken thighs to feed 6-8 servings, I'd say this qualifies as a meat-stretching meal. The chicken flavors the lentils, which add fiber and more protein to the dish. Using leeks, corn, and salsa verde all put up from my seasonal CSA farm share pumps up the vegetable content, the rice binds it together, and the cheeses make it all tasty. 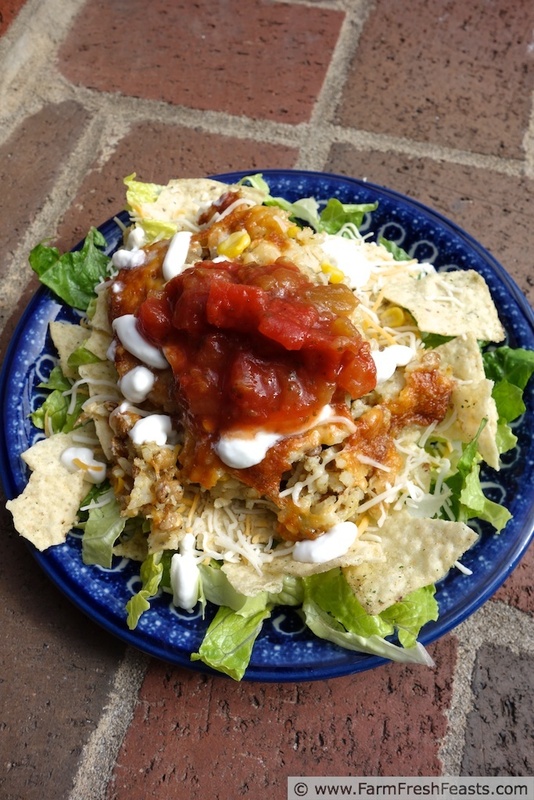 We ate this the first time a bit like we eat Taco Farro: with tortilla chips, sour cream, salsa, and lettuce. Leftovers went into thermoses for school, onto salads for lunch, and scooped up as a pre-dinner snack by a tortilla-chip-weilding hungry spouse. Keep this Kitchen Sink idea in mind if you want to create a "less meat, more fiber" flavorful meal for your family. It appealed to all of us, and I hope it appeals to you. Preheat oven to 350 degrees Fahrenheit. In a large skillet, over medium heat with a turn of cooking oil, sauté the leeks for 3-5minutes until fragrant. Stir in corn and spices. Add chicken and lentils, heat through. Taste and see if you'd like salt, pepper, or more spices. I used several grinds of pepper (1/4 teaspoon) and a couple of healthy pinches of kosher salt, about 1/2 teaspoon total. If your skillet is big enough, fold in the rice, salsa verde, cream cheese, sour cream, and 1/2 cup shredded cheese. My skillet is not capable of all that. I dumped the rice, salsa verde, and dairy into a giant bowl, combined it, then scooped the skillet contents over top and stirred them all together. 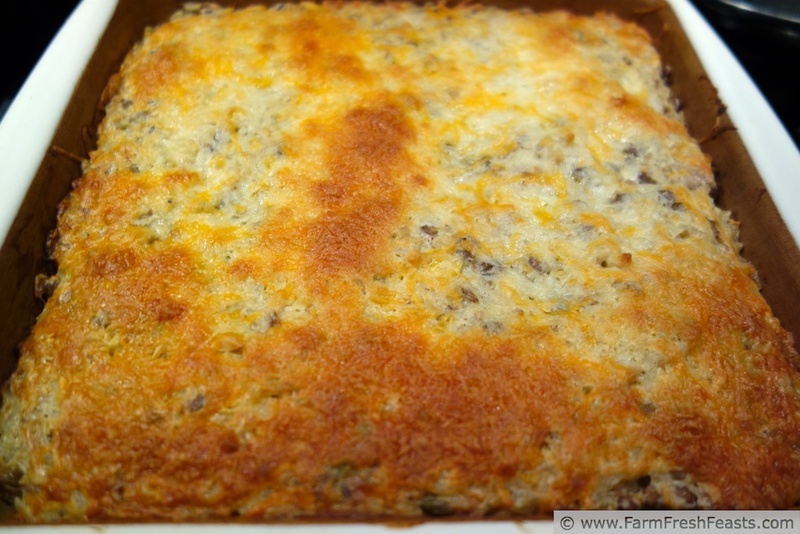 Spread the mixture in a 9x9 baking pan, top with the remaining shredded cheese, and bake for 30 minutes until browned. Serve with extra salsa verde or tomato salsa, sour cream, shredded cheese, tortilla chips, salad greens . . . oh, and I bet guacamole would be delicious with this too. This recipe is shared with the other fresh kids, in the Wednesday Fresh Foods Link Up, What's Cookin' Wednesday, Foodie Friends Friday, What's In The Box at In Her Chucks, The From The Farm Blog Hop, Strange But Good at Sprint2TheTable, Food on Friday, and the Clever Chicks Blog Hop. This looks great! I've never used lentils in a mexican dish, I'll have to give it a try. I am always looking for ways to stretch the meat. Nice! I am always looking for new ways to use lentils. They might be my favorite legume! I don't know that I have a favorite legume, I'll need to think on that. Now that I'm not minutes away from a Costco and their giant vats of Sabra for cheap, I'm getting into hummus lately, so garbanzo beans are a common sight here. I do love how no advanced planning is required for lentils since they cook up so quick. What's not to love? So creative to use lentils in a Mexican recipe -- not common, but intriguing. I am convinced that all amazing concoctions recipes started because some cook substituted what she or he had on hand, and it worked so it became the stuff of legend. Not that I think this Kitchen Sink casserole is legendary, please don't misunderstand! Just trying to feed the family with what I've got--though I'm delighted with how this one turned out. I could go for a bit of this ole too! I'm glad to have found the Foodie Friends Friday and add a bit of Fiesta to the Party. I'm vegetarian, but I could substitute another type of bean for the chicken and I think I would LOVE this! Thanks for sharing! Absolutely! Red kidney beans would be a very colorful substitution for chicken in this dish. Hi! Just following the #strangebutgood party -- I LOVE mixing baked food with fresh produce for my salads.. this looks delish! Great minds do think alike. Now that my CSA farm share has started I'm enjoying freshly picked local salad mix and it's great with anything I can throw on it. It really was--each variation worked really well, even as an appetizer, which surprised me. That looks so delicious. It's one of my favorite types of meals and I love to spice it up with hot salsa. I'm waiting for my daughter to come around to spicy foods--right now my spouse, son and I are the spicy foods lovers in the house, though the spouse wins with his hot sauce on nearly everything. But I tend to cook to the lowest common denominator, spice-wise, and then do like you say with salsa on my plate to give me the flavor I want. I'm always looking for new eats, too! I enjoy seeing all the new recipes in one place--link ups are great. I look forward to checking it out. Thanks for the invite, and thanks for stopping by! I love a good old Kitchen Sink type recipe. The more leftovers you use, the better. I'd say you're ready for your CSA to start. By the way, now I'm craving Mexican. Yes. Yes to all of the above. 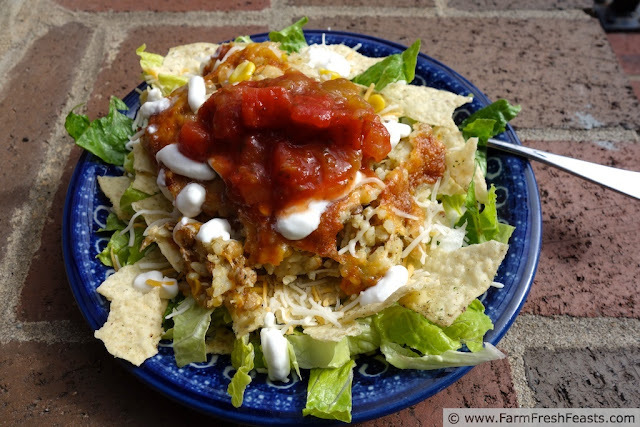 This Mexican dish looks and sounds great, can't wait to try it..........Thank you for sharing with the Clever Chicks Blog Hop this week; I hope you’ll join us again! I always wonder about sharing a chicken recipe with chicken people. I know retired laying hens make lovely rich stock, and am delighted when I can get some from the folks where I get my eggs. Yum! Some of my favorite ingredients thrown together in one beautiful dish.